Melinda Sue Lewis, daughter of Billy Lewis, came to town with her daddy in 1983. She was instrumental in convincing her father to marry Vanessa Spaulding, whom she adored. As soon as she got to town she started dating Phillip Spaulding, but the heir to Spaulding Enterprises didn't pay enough attention to her, so she made it look like her horse trampled her and landed herself in the hospital in a ploy for attention. Her roommate was Beth Spaulding, and their new friendship set in motion the friendship between Rick, Phillip, Beth and Mindy that would henceforth be referred to as The Four Muskateers. 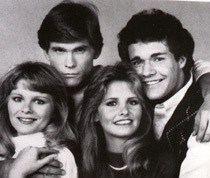 Phillip and Rick were both smitten with Beth, but Phillip backed off and continued to date Mindy. She was constantly jealous of Beth, but she fought to keep Phillip. When Beth was raped and rejected Phillip, Mindy seduced him and got pregnant. When Phillip and Beth ran off to New York, Mindy and Rick followed, which formed a bond between them. Mindy was pregnant, and back in Springfield Rick convinced her to pass the baby off as his and marry him. She agreed and they were about to be married in a quick ceremony when Billy interrupted it, wanting to know why she hadn't told him Phillip was the father. Phillip loved Beth, but he wanted to provide his child with the family he never had, so he married Mindy. She had finally gotten what she wanted -- Phillip Spaulding -- but now that she had him she was pining for Rick. She eventually lost her baby and divorced Phillip, but meanwhile Rick lost his virginity to the older Claire Ramsey. Mindy was attracted to Lujack, but he only had eyes for Beth. Once again she was thrown over for sweet Beth Raines. Rick became involved with Roxie Shayne, Reva's sister, and a jealous Mindy brought Roxie's abusive boyfriend Dub Taylor to town. When Dub revealed that Mindy had brought him there, Rick rejected her and grew closer to Roxie. Mindy turned to shady Kyle Sampson for comfort. Kyle was only using Mindy to get to Billy, who he believed was his brother. He was, but not because Kyle was really a Lewis, as he suspected. Billy's real mother was Sally Gleason, Kyle's mother. When she found out about his vendetta against her father, Mindy got drunk and shot Kyle. Mindy began working at Company with her rival Roxie and Roxie's boyfriend from Alaska, Kurt Corday. Rick helped Roxie recover her memory, and Kurt and Mindy fell in love and got engaged. Kurt was an illegal alien from Canada, only living in the United States legally because he was married to Rosie Smith, as Roxie called herself when she had amnesia in Alaska. Roxie crashed Kurt and Mindy's wedding and married Kurt herself to keep him in the country, but the customs officials gave Kurt a reprieve and had his marriage to Roxie annulled. Kurt and Mindy finally got married and were happy until the Sampson Girl contest. Mindy, Roxie, Beth, and Jessie Matthews all entered, but Mindy won. It spelled disaster for her marriage, however, as she was forced to travel quite a bit and she signed a no pregnancy contract while Kurt was home, building a house for them and dreaming of having a family together. When the Sampson Girl contest was revealed as a fraud, Mindy returned home, only to find Kurt and Roxie asleep in one another's arms inside the house he was building for her. Nothing had happened, but she jumped to the wrong conclusion and knocked over a kerosene lamp on her way out. The house burned down, but Hawk saved Roxie and Kurt. Mindy realized that she couldn't be the wife Kurt wanted, and she admitted to starting the fire. A disillusioned Kurt left for Venezuela to work on the Lewis' oil rig. Mindy's next chance at love was with Rusty Shayne, Reva's little brother. She wasn't cut out to be a cop's wife, however, and that spelled the end of their relationship. She became involved with Will Jeffries, Sonni/Solita's psychiatrist. She disappeared when he turned out to be nuts. Desperate to get her back, Will kidnapped Marah Lewis and left her with his unstable mother. Rusty's new wife Rose was killed and Mindy returned to Springfield. Rusty convinced her to help him get the low-down on Will, but Will figured out that Mindy was gaslighting him and drugged her, holding her at gunpoint. Rusty, Josh and Sonni saved Mindy, but she stayed behind in Springfield when Rusty went back to Tulsa to become chief of detectives. 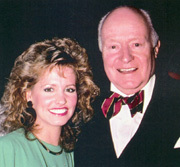 Rick and Mindy picked back up their on-again, off-again romance, and Rick proposed in 1990, unaware that she was also carrying on with Roger Thorpe. Mindy really loved Roger, and I think Roger loved her too, in his way. She broke up with Roger eventually and rushed to Rick, finally realizing he was the man for her, only to find out he'd married Beth. Not knowing they'd only done it to protect Phillip, she turned to Mallet for comfort. Roger wanted to marry Mindy, but he was married to Alex and she wouldn't let him go. She threw herself into her fashion line, hiring Harley to help her out. She couldn't stay away from Roger, though, and they made plans to marry someday. She was carrying Roger's son when Alex found out about the affair, and a devasted Mindy miscarried. Mindy ended the relationship when she found out that Hart was Roger's son. While Mindy was in New York on business, she was startled to see a man who was Lujack Spaulding's double. His name was Nick McHenry, a reporter. She was always attracted to Lujack, so meeting Nick was like having a second chance. Nick followed Mindy to Springfield and they grew closer, much to Alex's chagrin when she found out that Nick was her other long-lost son. How anyone can not know that they gave birth to twins is beyond me, but it's only a soap. Nick went to work for Spaulding for awhile, but it was destroying his relationship with Mindy and he got too caught up it the greed and power, so he left and went to work for the Journal. In an effort to keep the truth from Nick, who didn't believe that Alex was his mother, Mindy switched DNA results proving he was indeed Alex's son. 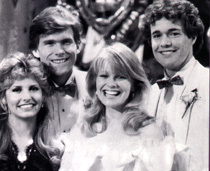 Alex did her best to ruin Nick and Mindy's relationship, lying to Mindy and causing her to leave town right before their wedding. Just as Nick and his old girlfriend Eve were reestablishing their relationship, Mindy called home. When Nick caught Eve lying about Mindy, he broke up with her and he and Mindy rekindled their relationship. Eve went crazy, drugging Mindy just before she got behind the wheel of a car containing little Billy. She and Nick fought about Eve when Eve was released from the mental hospital, and Mindy started dating Macauley West. When Macauley invited her to go to Chicago with him, she said no and reconciled with Nick again. Nick decided to change his name to Spaulding and marry Mindy, alternating delighting and crushing Alex. Just before the wedding, Roger was shot. Billy went to jail for shooting Roger, and they went on with their wedding plans. They got married for real a few months later at the Lewises'. 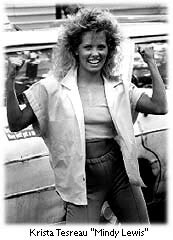 She walked out on him, however, when he helped Alex sabotage Lewis Oil so that Vanessa would have to sign everything over to Spaulding to save the company. Alex finally relented and told Nick to give up on business and save his marriage. Nick and Mindy gave it one more try, and due to Mindy's history of troubled pregnancies they decided to adopt a child. The adoption process, however, forced them to face the fact that their marriage was over. They divorced and Mindy left to work on her fashion line in Europe. She returned home briefly for H.B. 's memorial service, but she didn't even see Rick while she was in town. It was a very disappointing visit. Krista Tesreau originated the role of Mindy Lewis, and to me she will always be Melinda Sue Lewis. She joined the show in 1983 and left in 1990, when she was replaced by Kimberley Simms. Kimberley left in 1992, and Ann Hamilton took over the role for a short time in 1993. She was replaced in 1993 by Barbara Crampton, who stayed with the show until 1995, when Mindy left for Europe. 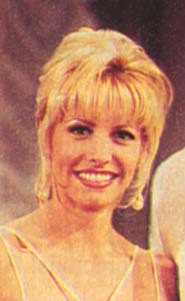 Kimberley Simms returned in 1997 for H.B. 's memorial.